Hello my friends. I hope you're all having a great first week of December, planning for and enjoying Christmas preparations and the beauty that is called December. 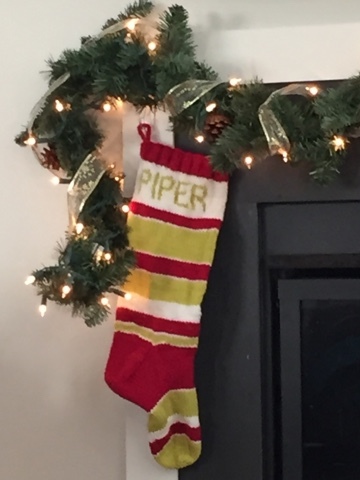 I made it to Miss Piper's house on the East Coast on Tuesday and this is a post filled with a gallery of her pictures. Sorry if they bore you but I'm a Grandma and this is what we do! 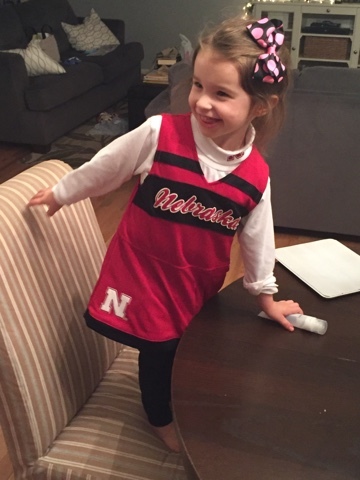 Here she is in her Nebraska cheerleader outfit. Since both sides of her family come from there, it's inevitable that she had a getup like this. Go Huskers! 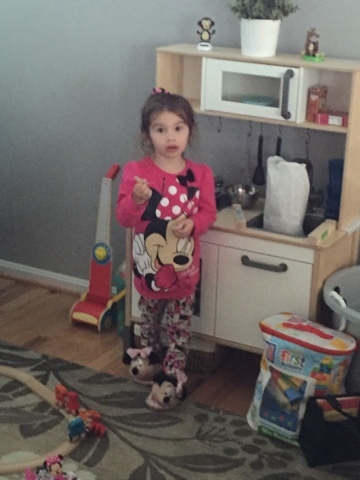 Papa sent this Minnie Mouse outfit complete with the hair bow. We got her the slippers on our last trip. :-). She's quite the Minnie fan. 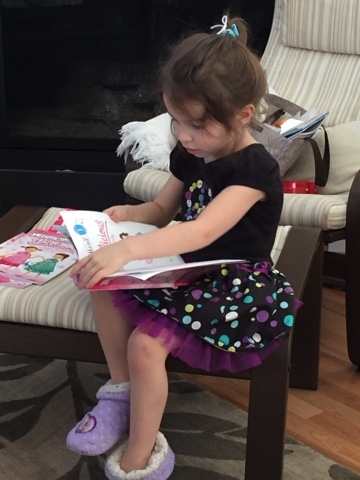 Reading her new library books to Grandma after we went to story time on Thursday. 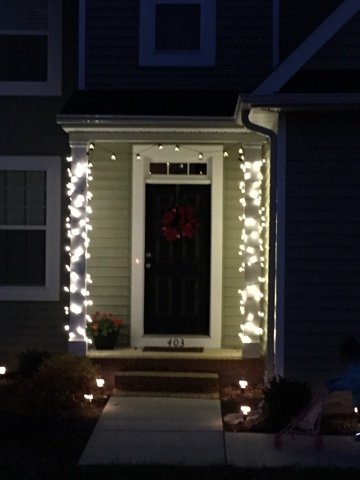 Pretty lights greet you at the front door. And then Grandpa flew in today! Piper was SO happy to see her Papa. He had to sit in the backseat with her while she jabbered away to him all the way home. Now it's Papa's turn to read to her while she eats Oreo cookies that Grandma bought her. It's what Grandma's do! I thought I would share a picture of the stocking I made for her first Christmas that is hanging on the mantel. Mandy and Brad have matching ones I made when they got married. Tomorrow is our 27 year old baby's birthday who lives waaaay across the world in Tokyo. Happy Birthday Alex! We miss you so much. And now it's time to sleep. This little one wakes up early and we need our sleep to play. I'm so glad Dennis is there safe and sound.. I bet you feel so much better having everyone together. Enjoy your time and thanks for sharing pictures of Piper and all that you're doing.. have fun! Looks like you are having a great time, there is nothing like playing with Grandchildren to make your day, I love it. I love that you are all together enjoying little Miss Piper. I bet she is in Heaven with both of you there. Love the Minnie Mouse stuff, I have a big Mickey fan here. Have a wonderful visit. 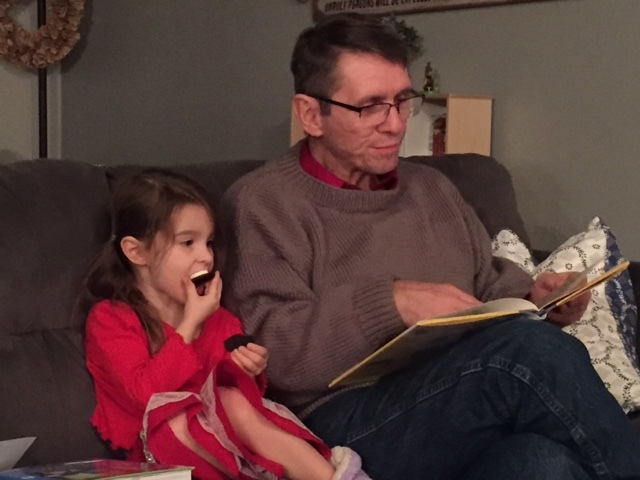 Oh love your photos of Piper and then grandpa Dennis reading to her. Have a great time together. Happy birthday to your son Alex. Now Mrs (notso) Grumpbunny needs to get ready for work!! Hugs and prayers my friend!! Well, she looks cute in her Nebraska outfit but I just remind Many and Brad that Iowa beat them! Tee Hee! I couldn't resist! Sorry! My favorite is the Minnie outfit anyway. Glad you and grandpa both had safe trips there. Enjoy! Did you knit that stocking? It's gorgeous! Have fun! A very happy (belated) birthday to your son! 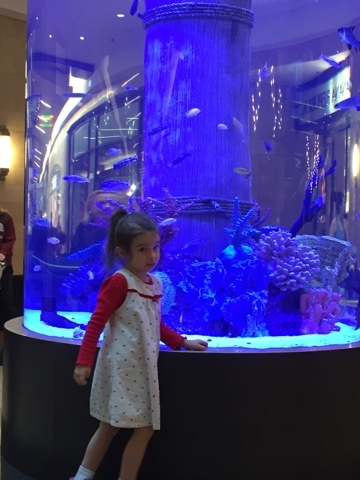 Looks like you are really enjoying time with little Miss Piper! !